This nice little hike is a gem. 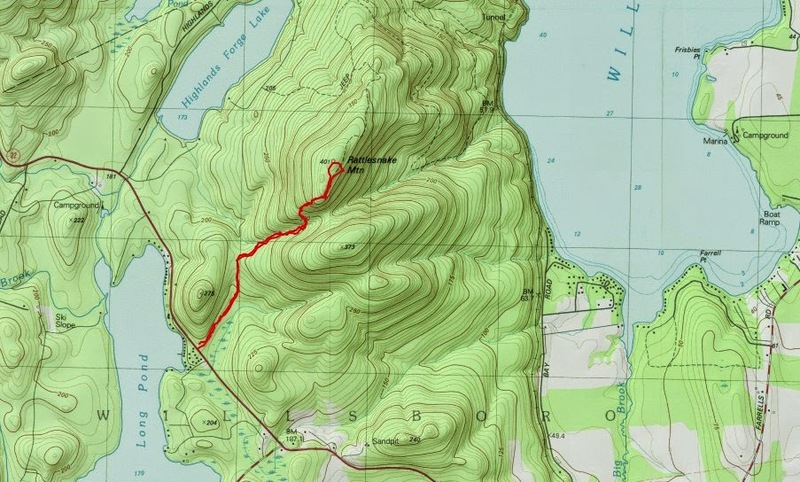 Rattlesnake mountain lies just west of Willsboro Bay, Lake Champlain and offers fantastic views of the bay and the lake. On this day of poor visibility, we couldn't see beyond the bay, but if was enough. The trailhead is easy to miss, but it is located on the east side of Route 22, just south of Long Pond. There is a small parking area, and the sign below is located there. This trail is located on private property, but the property owner has graciously allowed hikers and hunters to use the property. 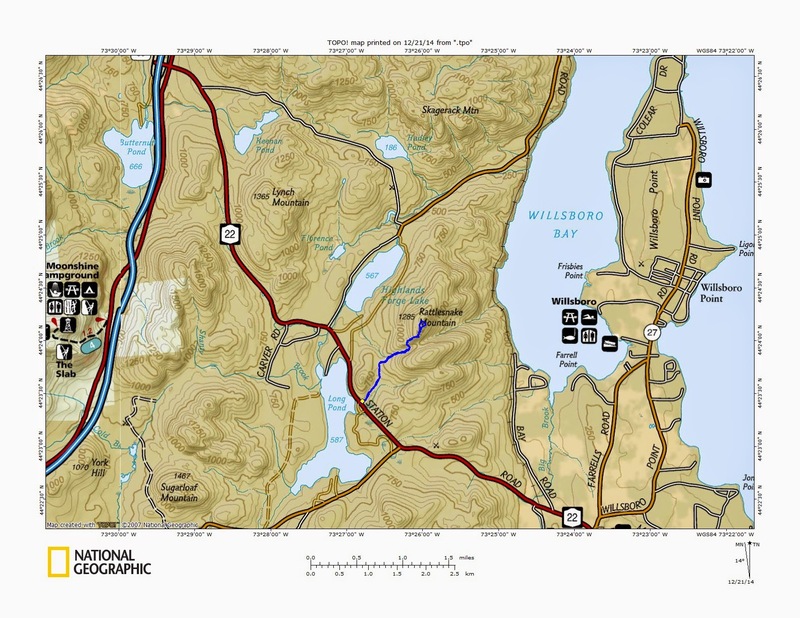 The trail is shown on the latest version of the Lake Placid National Geographic topographic map. The trail follows an old jeep road for one mile, and climbs 300' before turning left and leaving the jeep road to reach the summit ridge. The jeep portion would be a great spot to XC ski. Once on the upper foot trail, there are large boulders interspersed with red pines and the area is very attractive. The final .3 miles is relatively steep but not severe. Families with younger children might want to consider this hike. At the top is the payoff of a fine view on a clear day. We could only see as far as Willsboro Bay. The summit was very pretty in the snow and the frosty trees. Even on this cloudy day, it felt like a magical place to be. From the overlook, I backpedaled a few hundred yards to reach the true summit of the mountain. The whole summit is open hardwoods and would also be nice for XC skiing. The only hard part is the last push from the jeep road to the top. It was an easy return hike to the car from the summit. 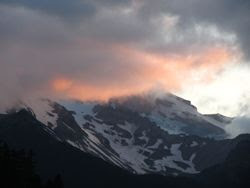 I don't know if this mountain gets much traffic, but it is well worth a look. Hi, I first stumbled on this blog 2 years ago while looking for info on the trails near Sharp Bridge Campground. Whenever I do my pre or post hike research, this blog usually pops up in top results. I think you have great trail input... So when I saw that you called Rattlesnake a gem before our "climb" of it, I was very curious... Right on the money! This easy hike is definitely a gem. Also, not a big deal, but I assumed that area was the Summit as well... It's not. The real Summit is off a side trail headed towards the "Trail ends" sign. It's marked with tape. Thanks for the kind words and for the comment about the true summit. No problem. Keep up the good work and thanks!